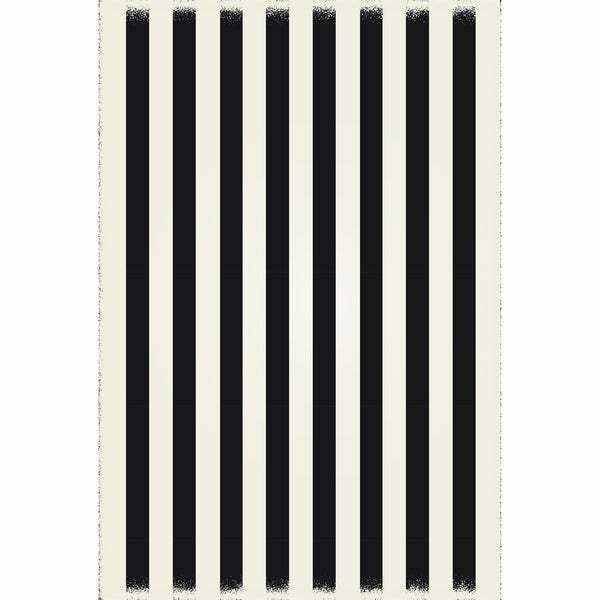 Strips of European Design - Black & White colors, a weather aged finish- durable & multilayer technical grade vinyl rug. Strips of European Design - Black & white colors, weather aged finish- super durable and multilayer technical grade vinyl rug. Strips of European Design - Grey & White colors, a weather aged finish- super durable &multilayer technical grade vinyl rug. Reasonably priced alternative to traditional rugs for kitchens, baths, offices and high traffic areas. Designs for indoor and Outdoor cover areas. Durable manufacture with UV materials, certified non-slip, lay flat vinyl flooring. Each rug comes as a hard roll. To flatten unroll the mat then lay it in the sun or next to heating element until the rug has softened. Then place the rug on the intended resting surface. As the rug cools down it clings to the floor and flattens out completely. No adhesive necessary. Dimensions 60.0 In. X 48.0 In. "What sizes are available "